Receives the bin from the forklift, inverts it, washes all surfaces with high pressure water, turns the bin back upright, and stacks bins 3 high for return to the field. 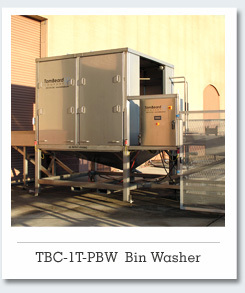 Recycling of wash water is an option, as well as accumulation and transfer of stacked bins. More..
We look forward to seeing you at the next annual national or trade show! Santa Rosa’s Tom Beard Company WINS North Bay Maker Award! How Can Tom Beard Company Help You with 25% Water Reduction? The Tom Beard Company Receives Official "Bay Area Green Business" Certification! The Bay Area Green Business Program distinguishes small businesses that protect, preserve and sustain our environment. Tom Beard Company & P&L Specialties Join Forces! For added ease and convenience we are now accepting Visa, Master Card, American Express, & Discover cards. Call 707-573-3150 or email parts@tombeard.com now to satisfy your parts and service needs. The Tom Beard is proud to have Cellar-Tek Supplies as our exclusive Canadian distribution agent. Cellar-Tek opened their doors in 2004 and pride themselves on their excellent products and service. 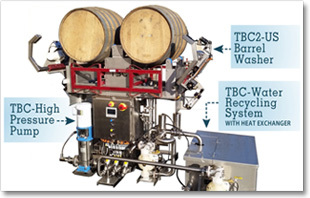 We are pleased to have Cellar-Tek providing our premium equipment to the wine industry in Canada. The Tom Beard Company is thrilled to have Hans W Schloss S.P.C. as our exclusive South American distribution agent. The Tom Beard Company and its employees are dedicated to making a difference where we can and are committed to ensuring that our community is better for our existence in it. The Tom Beard Company was pleased to support the Sunrise Horse Rescue in St. Helena California, the Northern California Leukemia and Lymphoma Society, as well as the Redwood Empire Food Bank this holiday season. Our employees serve the local community on several boards and advisory committees: Sonoma County Workforce Investment Board, Sonoma County Youth Council, Sonoma County Probation Camp, and 101 MFG. We also support the local youth as soccer coaches, football coaches, basketball coaches, boosters and many other ways. We value where we live and want to do our best to help.